These features include: 20 mm faders; selectable +/-6dB or +/-12dB boost/cut range for precise gain adjustments; XLR, and 1/4" TRS connectors for installation ease; balanced inputs and outputs for quiet operation; and chassis/signal ground lift capabilities for quick hum isolation. The visionary design of the dbx 2-Series has been pursued to make your job easier. 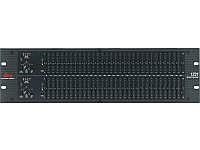 The 2-Series represents a major step forward in the performance of entry-level graphic equalizers. From its amazing 10Hz to 50kHz frequency response, to its 108dB dynamic range, internal toroidal transformer, the 2-Series offers out of this world specifications wit a own to earth price point. 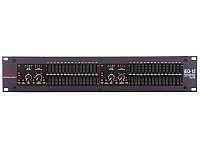 Sure to find a home in the studio, on tour and with installed sound venues, the 2-Series is destined to take its rightful place in tHe lineage of great dbx signal processors that are the professional's choice in signal processing. With such affordable quality, there's no longer any excuse for compromising your sound. The new Silver Titanium look make them stand out in an audio rack.